We've been busy covering Barrett-Jackson this week, but there are plenty of other auctions going on in Scottsdale as well. 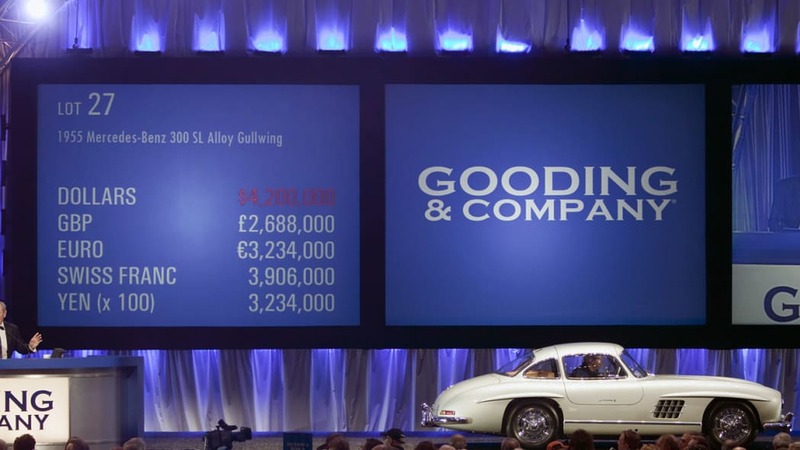 One of those is Gooding & Company, which has been selling some pretty incredible cars. Perhaps the most significant is this 1955 Mercedes-Benz 300SL Gullwing, which is just one of 29 built with an aluminum alloy body. Standard 300SL Gullwing prices can exceed a million dollars, but this particular example was expected to sell for anywhere between $2,500,000 and $3,000,000. These alloy 300SL Gullwings come up for sale infrequently, though, which is perhaps why the final bid of $4.2 million was so high. With auction fees, the final selling price of the 300SL was an incredible $4.62 million, a new record for this car. You can read more about this particular 1955 Mercedes-Benz 300SL Alloy after the jump, and check out photos of the car in the gallery above. "[The 300 SL Coupe] is the ultimate in an all-around sports car. It combines more desirable features in one streamlined package than we ever imagined or hoped would be possible"
If not for US importer Max Hoffman and his passion for a sports coupe based on the highly successful W194 series race cars, the Mercedes-Benz immortal 300 SL line would never have come to production. The racing success of the factory team was having a positive effect on Mercedes-Benz sales in the US. However, without a car clearly related to the race-winning machines, the marketing advantage of the immensely costly racing effort was limited. Accordingly, Mercedes-Benz management approved the 300 SL project after Mr. Hoffman's firm made a commitment to purchase 1,000 of the cars for US distribution. Integral to the marketing plan for the groundbreaking new sports car was the expectation that the cars would be used for competition by private owners in order to bolster sales in the showrooms, and the factory ensured that the 300 SL was accepted by the FIA for international competition. As a result, the production Gullwing could be ordered with an all-aluminum body. When chosen, many additional competition upgrades followed suit. A competition camshaft was fitted along with stiffer, shorter springs that lowered the car and enhanced peak performance, while racing-specification tires on wider rims promoted better adhesion. Plexiglass windows and vented brake drums were also featured in the package. The cars were nearly 200 pounds lighter than the standard steel-bodied version. In all, just 29 of these aluminum-bodied cars were ordered and built – approximately 2% of the total Gullwing production. 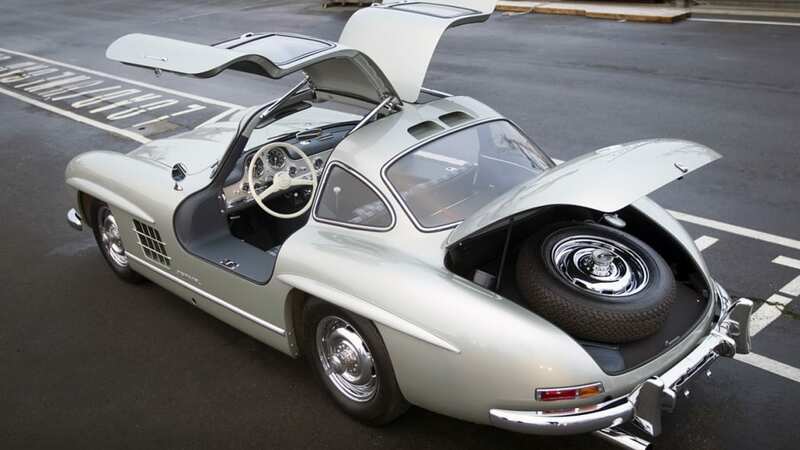 Derived for sport, this aluminum Gullwing did not see competitive use. Completed on April 20, 1955, 5500208 was appropriately finished in metallic silver gray over a blue leather interior. The 300 SL was also outfitted with Rudge wheels, the NSL motor and Plexiglas windows per aluminum-build specifications. On May 27, 1955, the Alloy Gullwing was sent to Rotterdam where it was loaded aboard a Holland America Line ship for transport to New York. Upon arrival, the Mercedes-Benz distributor sent 5500208 to the West Coast for ultimate delivery to Veron Holz of Bonita, California. The new aluminum-bodied Gullwing would have been an extravagant machine on the roads of San Diego in the late 1950s. Although the early history of this Gullwing is not known, there is no apparent race record for 5500208. In March 1980, the 300 SL resurfaced in San Diego and was sold through a motorcar locator to Hans Dieter Blatzheim of Bonn, Germany. The purchase price was an astonishing $57,000 for an unrestored car, which the seller most likely assumed was steel. The invoice for the purchase still exists, indicating the alloy chassis number 198.043.5500208. In need of some attention, the Alloy Gullwing made its way to the well-known restoration shop Hill & Vaughn in Santa Monica, California. 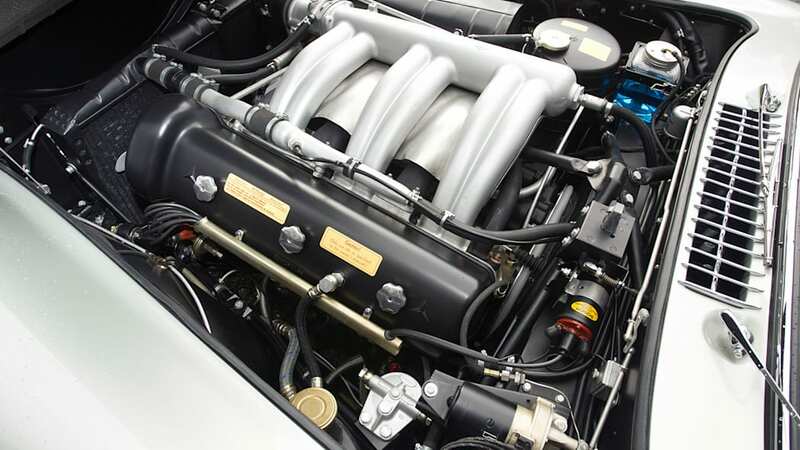 Phil Hill and Ken Vaughn had gained a reputation for their high-quality restorations and were frequent winners at the Pebble Beach Concours d'Elegance. Disassembly of the car began in April 1980, and the car is accompanied by a significant file of numerous invoices and photographs documenting the work performed by Hill & Vaughn. The invoices identify the completeness of 5500208, as well as its solid state, which was no doubt a benefit of having spent 25 years in Southern California. Some necessary aluminum work was addressed and the meticulous fitting of the doors, hood and deck lid are thoroughly outlined. Additionally, the engine and gearbox were sent to AMG Motorbau in Germany for rebuilding. Subsequently returned to Hill & Vaughn in early 1982, the project was nearing completion. By mid-year, the car was ready for paint and assembly. For unknown reasons, Herr Blatzheim requested that 5500208 be packed in a sea container and sent to Germany. The car was loaded and loose parts were thoroughly inventoried before shipment in November 1982. The completion of the restoration was conducted in Germany, but not before the body was stripped and prepared again for paint. Photos dated October 1983 show the bare aluminum skin in outstanding condition, proving straight and showing good panel fit. Further photo documentation shows the restoration and assembly of the chassis and completion of the car in silver with gray leather. In May 1984, the 5500208 was sold to Markus Ahr of Germany. During his ownership, work was performed by Daimler-Benz Aktiengesellschaft including a rebuild of the engine. Herr Ahr kept the car well into the 1990s, at which time work was performed by Kienle Automobiltechnik. Photo documentation shows a rebuild of the transmission, rear end, brakes and suspension. Retaining the silver-over-gray finish, detail work was conducted on gauges and other ancillary components and the project was completed in 1998. Not long after, the Alloy Gullwing was sold to Friedhelm Loh, a noted German collector with a passion for significant Mercedes-Benz. In 2009, Ken McBride of Seattle, Washington, was given the opportunity to buy 5500208. Having had a handful of Gullwings, Mr. McBride appreciated the importance of an Alloy and, for the first time in his many years of collecting, had the chance to own one. Although his collection was significantly diverse, Mr. McBride had always focused on Mercedes-Benz and had acquired a 540 K Special Coupe, a 540 K Cabriolet A and eventually a 380 K Erdmann & Rossi Special Roadster. After some serious thought, and perhaps a little family persuasion, the Alloy Gullwing was bought for the collection. In the company of a J Duesenberg Murphy Roadster, a Ferrari 410 Superamerica and other significant cars, the 300 SL was more than a notable entry, it was a dream come true for a man who had an Alloy Gullwing high on a short list of cars to own. In late 2009, Mr. McBride fell ill and the newly acquired Mercedes-Benz took a back seat. At that time, the Gullwing was sent to noted 300 SL restorer Rudi Koniczek at Rudi & Co. for some necessary sorting. Mr. McBride wanted certain aspects of the car corrected, predominantly the shade of silver and the interior. In the months to come, the Alloy Gullwing was stripped to bare metal and repainted in its original silver (DB 180). Necessary body work was conducted and a methodical process was undertaken to ensure proper assembly and fit of the aluminum body. The gray leather interior was removed and the correct blue leather was installed. Some additional mechanical work was conducted, as well as detailing of various components. 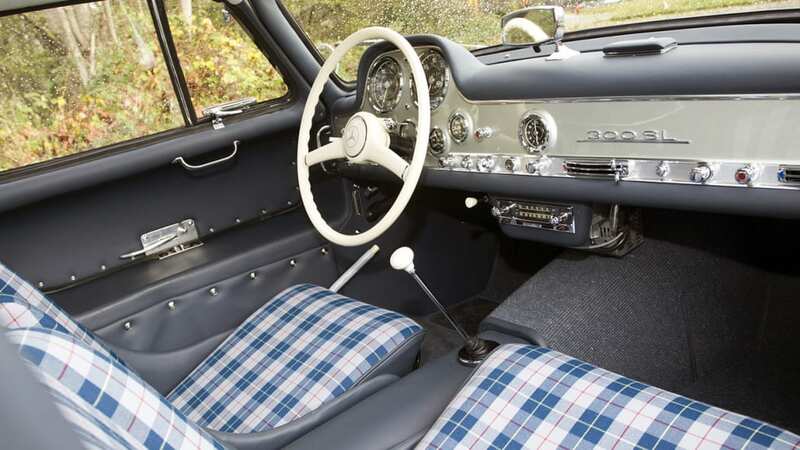 One deviation from the original was the addition of seat cushions upholstered in plaid, acknowledging the lightweight car's racing alter ego – they are a marvelous touch. In mid-2011, Mr. Koniczek had finished the restoration but, sadly, Mr. McBride passed away before he could see the final masterpiece. The result was truly spectacular! Shortly after, Mr. McBride's wife Patty and the rest of the McBride family chose to show the Alloy Gullwing at the Kirkland Concours d'Elegance where it rightfully won its class. The finish of the 300 SL is of the highest level and the car retains a very correct appearance. With a livery that is a tasteful yet bold statement, the quality of the work and attention to detail is obvious and further inspection reveals the purity of this Alloy Gullwing. The original engine remains, correctly stamped NSL, and the body number can be found stamped on the left wheel arch in the engine compartment. 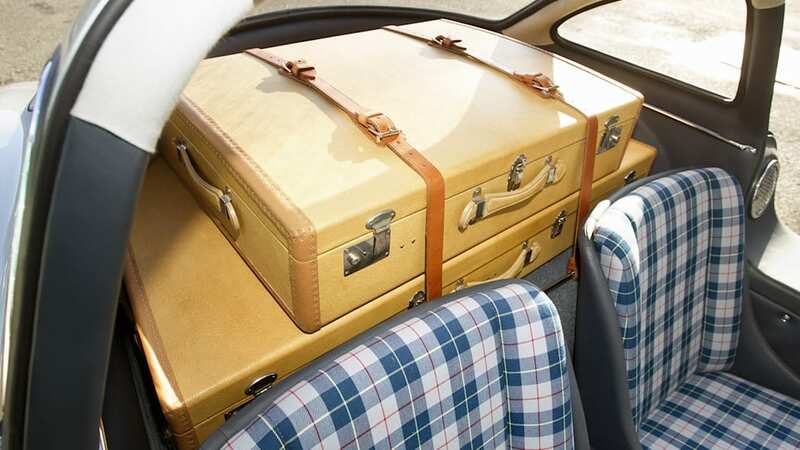 Additionally, the Gullwing has belly pans, its chrome Rudge wheels are original, the luggage is properly finished in natural pig skin, the Becker radio is correct, the grille has the proper "curved star" – the list goes on. Furthermore, this Alloy Gullwing is accompanied by a tool kit, a knock-off hammer, a jack, comprehensive documentation, the Mercedes-Benz Certificate, an owner's manual, an instruction manual, a spare parts catalogue, a service book and Becker radio manuals. 5500208 is a sensation to drive. Its road manners are what one would expect from any beautifully engineered motorcar. The true excitement, however, is when this supercar comes on cam. With abundant power and torque, and precise gearshift, this Gullwing is simply addictive. In recent years, these ultra-rare, competition- specification cars have come to be recognized by collectors and enthusiasts for what they have always been – truly the best of the best. They are a tiny group of factory-built, lightweight racers, constructed with the express intention of increasing the public visibility of one of the greatest sports cars ever constructed. Gullwings are routinely acknowledged as favorites in a collection of any size. They are prized for their magnificent engineering and build quality, purity of design and outstanding driving experience. Aluminum-bodied examples – all 29 of which have survived to this day – are very seldom offered for sale. 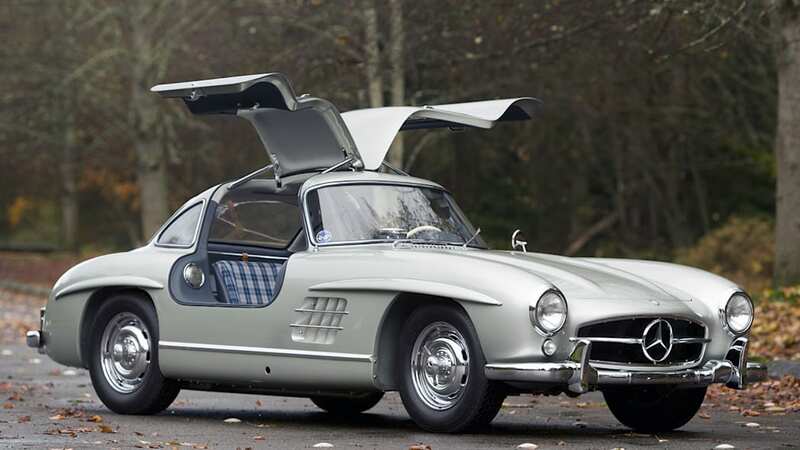 As one of the most iconic motorcars of all time, it can easily be said that the Alloy Gullwing is the most significant road-going Mercedes-Benz of the post-war era.